The two sides will be pushing to arrange a second summit between their leaders. Pompeo said in an Oct. 19 interview with the Voice of America that he hoped to have talks with his North Korean counterpart “in the next week and a half or so” to continue discussions on the North’s denuclearization and the potential summit. “At the time of Secretary Pompeo’s remarks, (the meeting) was being planned for the end of October, but I understand that it was delayed by a couple days due to circumstances on the US side,” said the source with knowledge of US-North Korea negotiations. “The location will probably be the US East Coast,” he said, raising the possibility of Washington or New York. If realized, the meeting will come shortly after the US midterm elections on Nov. 6. US President Donald Trump earlier said he expects to meet North Korean leader Kim Jong-un after the elections in one of three or four locations. The summit will likely happen early next year, according to US National Security Adviser John Bolton. The deal’s implementation has stalled as the US demands verifiable steps toward denuclearization and the North an easing of sanctions against the regime. 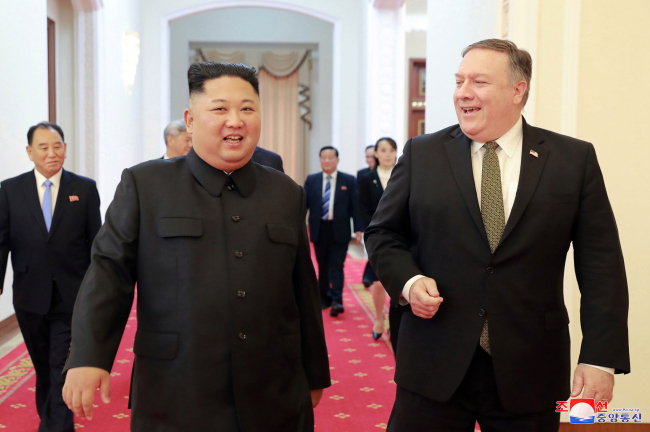 The source said Pompeo’s counterpart in the upcoming talks is likely to be Kim Yong-chol, a top aide to the North Korean leader. The two met in New York in May to finalize the details of the summit in June. At the time Kim Yong-chol also met with Trump at the White House to deliver a letter from the North Korean leader. On the table will likely be ways to realize North Korea’s stated commitment to denuclearize, including Kim Jong-un’s invitation of international inspectors to the nuclear testing site in Punggye-ri, the source said. Kim has also committed to dismantle a missile engine testing site and, in return for “corresponding” measures from the US, shut down the main nuclear complex in Yongbyon.